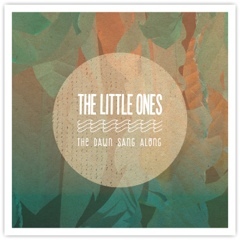 Atlas and the Anchor: The Little Ones - "The Dawn Sang Along"
The Little Ones - "The Dawn Sang Along"
After nearly five years, Los Angeles-based indie-poppers The Little Ones are finally set to release their highly-anticipated sophomore album, The Dawn Sang Along, via their own Branches Recording Collective today. Co-produced by the band and by David Newton of The Mighty Lemondrops, the new album shows the band branching out a bit; adding some 80’s-flavored synths to their already super-infectious, danceable, tropical-laced and 60’s-pop indebted sound. The band, led by brothers Ed and Brian Reyes along with Ian Moreno and Lee LaDouceur, have been joined by Kevin Lenhart and Ryan Wilson from the electro-rock band Division Day. The album opens with the upbeat first single, “Argonauts” and its mix of organic and electronic beats and island rhythms with swirling synths that begins right where their excellent 2008 debut, Morning Tide left off. “Boy On Wheels” follows with a deliriously fun sing-along chorus of “la, la, la’s” on the standout track. “Little Souls” features a thick, 80’s-loving synth bass line and a stuttering beat along with some swaying vocal melodies for another standout moment. Future single,”Forro” is set to a bouncy beat and twinkling keys and flickering guitar figures. A shuffling beat and catchy chorus highlight the aptly-titled standout track, “Catch The Movement” and its afro-pop inspired poly-rhythms and background vocals. “Shake Your Sign” features an echo-enhanced dub-reggae rhythm and a soaring vocal melody on the chorus. The percussion-heavy and reverb-rich “AWOL” sounds like beach music from the future. The mellow psychedelic vibe and Bossa Nova rhythm of “Art In The Streets” is bolstered by some shimmering, jangly guitars and kaleidoscopic keyboards for a nice change of pace. The title of the next song, “Super Bros.” probably isn’t but should be a knowing nod to the brothers Reyes in the band, who have effortlessly developed the sun-soaked emo-punk of their original band, Sunday’s Best into the infectious trop-pop of The Little Ones. “Body” is built on a hip-shaking disco-leaning dance groove and is sure to be a live favorite with its instantly memorable melodies. The propulsive, quasi-motorik rhythm that opens the album closer, “Ain’t It Like You & Me” is surrounded by layers of vintage organs swells and leaves you wanting more. Well, the wait was certainly worth it for The Dawn Sang Along but I just hope that we do not have to wait nearly as long for more new pop-perfect music from The Little Ones!